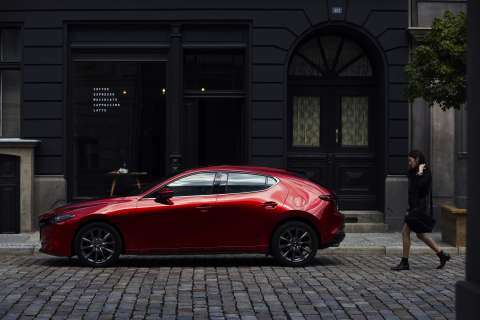 Mazda 3: A Triple Treat For 2019 | | A Wheel Thing. 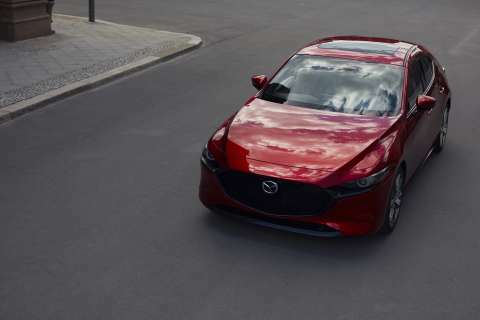 Mazda has released details of the 2019 Mazda3 at the Los Angeles Motor Show. Featuring a complete reskin and the SkyActive triple engine line, the revamped model will look to extend the six million sales achieved since it was released in 2003. 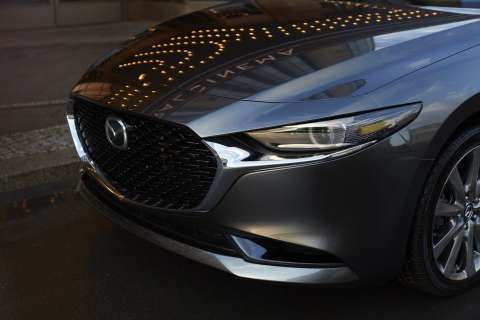 The powertrain lineup comprises the latest Skyactiv-X, Skyactiv-G and Skyactiv-D engines, each of which provides responsive speed control in any driving situation. 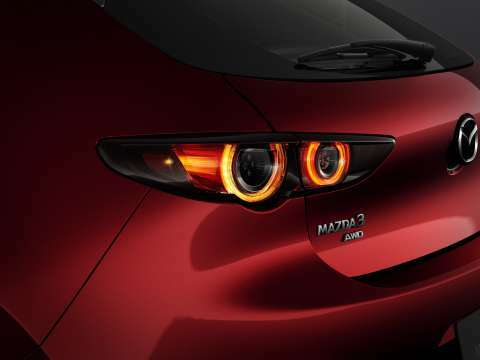 Mazda have split the sedan and hatch even further to offer the triple powertrains two distinct demographic attractions. 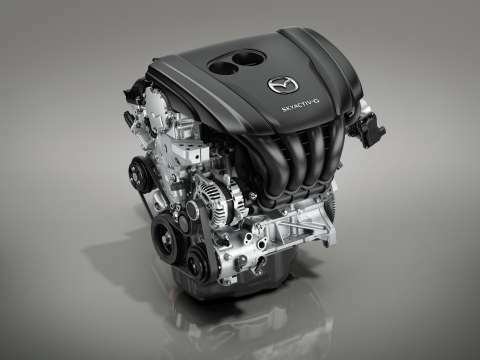 There are three SkyActive engines fed by petrol a diesel, and one that combines the characteristics of both. The petrol has a choice of 1.5L, 2.0L, and 2.5L, the diesel is just 1.8L. Power and torque figures are yet to be confirmed. What is known is that they’ll have a six speed manual or automatic transmission and a revamped all wheel drive system underneath. The CX-5 style GVC Plus torque vectoring system is also expected to be on board. Mazda have used their “Kodo“ design philosophy to give the hatch and sedan two similar yet different styles. The hatch looks as if it’s hewn from one piece, with no deliberate body lines and a heavy three quarter look. The sedan’s look is more of an evolution of the previous model and adheres to the bonnet/doors/boot ethic. The dimensions are noticeably different between the two side by side, with the hatch 5mm less in height and a full 203mm shorter. Width is identical for the pair. Both have gained extra forward vision with slimmer A pillars and relocated wipers, which are now under the shutline of the rear of the bonnet. Inside Mazda have overhauled the plastics and added real leather, the information interface, and the look. There is defined points of view that draw the eye to the redesigned steering wheel and the hub, the lines along the doors that lead to the windscreen. 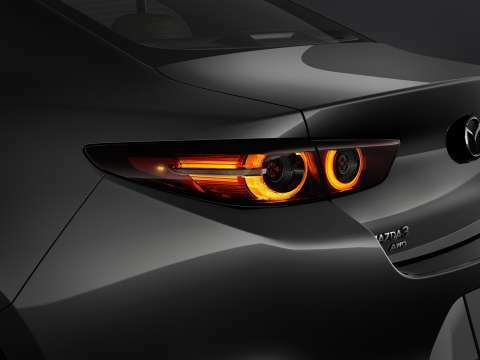 Mazda’s employed a process that attracts the eye to the shift panel, with a dual layer of laser etched and clear gloss. This houses a redesigned and repositioned gear selector, with it being placed forward and higher for a more natural “fall to hand”. The sound system has had the bass speakers relocated for better low end response, and the tweeters also relocated for a better sound stage. Mazda will confirm the release time at a later date. 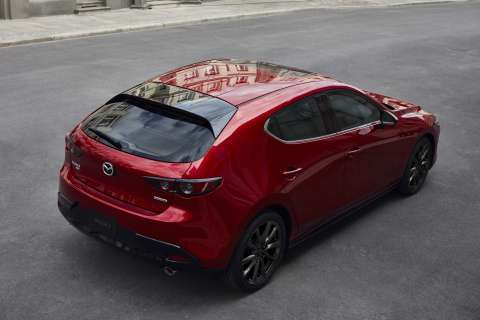 Be the first to comment on "Mazda 3: A Triple Treat For 2019"